The market is up a few days…then down the next few days. European debt is solved…and European debt is a problem. US government is cutting spending…and US government raises the debt ceiling. The dollar is strong…the dollar is weak again. Gas prices go down…and gas prices are up. Get the picture? Recession or not – people all over the world will have to get comfortable with a seesaw economy. When governments bailout a company, country, and/or raise the debt ceiling – it’s viewed as a temporary solution to a long term problem. However, in the short term, markets go up when the government excessively intervenes...but, inevitably, markets will go down in the long term. As a country’s government borrows money, this increases the deficit or debt that must be paid back eventually – and because the government doesn’t produce wealth itself, it must raise taxes on its citizens or cut spending in the long run to pay back what it has borrowed. Governments are extremely reluctant to cut spending, and instead will resort to increasing taxes or perhaps equally as bad – create inflation. 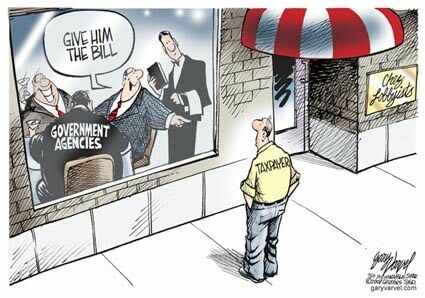 In the short term – government borrows money to support whatever objective it deems necessary. However, in the long term – raising taxes to reduce the deficit puts increased undue pressure on its citizens…which means less money for personal consumption (i.e. savings, education, health care, business expansion, or any desired purchases). Why the fluctuations? Why seesaw economics? FIAT money. A monetary system based on faith…if people lost faith (declared a currency to be worthless) then the value or worth of that currency will collapse. In essence, the government can eventually grow to “control” its citizens, because it “controls” the currency. By increasing taxes or continuously printing dollars that devalue the currency, the government can theoretically create workers that: don’t have enough for savings, will never retire, and can’t afford healthcare, can’t afford to own any assets (i.e. a home). Yet simultaneously, the government will increase the entitlement or welfare programs that are just enough to keep the populus working…without retirement until death. Thomas Jefferson said, "I place economy among the first and most important virtues, and public debt as the greatest of dangers to be feared. To preserve our independence, we must not let our rulers load us with public debt. We must make our choice between economy and liberty or confusion and servitude. If we run into such debts, we must be taxed in our meat and drink, in our necessities and comforts, in our labor and in our amusements. If we can prevent the government from wasting the labor of the people, under the pretense of 'caring for them,' they will be happy." To keep an economy strong, a nation’s citizens must focus on restoring sound economic policies and to minimize the government’s intervention in the private industry. It’s your life. BE FREE.